Rick Hopper: (02) Planet Crash? Rick “arrives” to a mysterious planet. Since this comic strip has a long way to go, it is fairly safe to assume Rick will survive this landing. I think no “CRASH” sound effect is a good thing for him. I don’t think Rick was expecting that when he opened the door. What did he land in? You would think Rick would have realized what he landed in from the smell. Looks like Rick missed reading one of the signs. Pretty convenient they were in English for him. Let’s assume that Rick has some kind of translation device or he knows the language. It is the far future, so anything is possible. You can almost figure it out what the sign behind the one of the Robo Guards says. It is never seen quite clearly. It reads “ABSOLUTELY NO ADMITTANCE WITHOUT A PASS”. I don’t think our hero has one of those. I loved the panel where Rick looks from the cliff over at to the city. 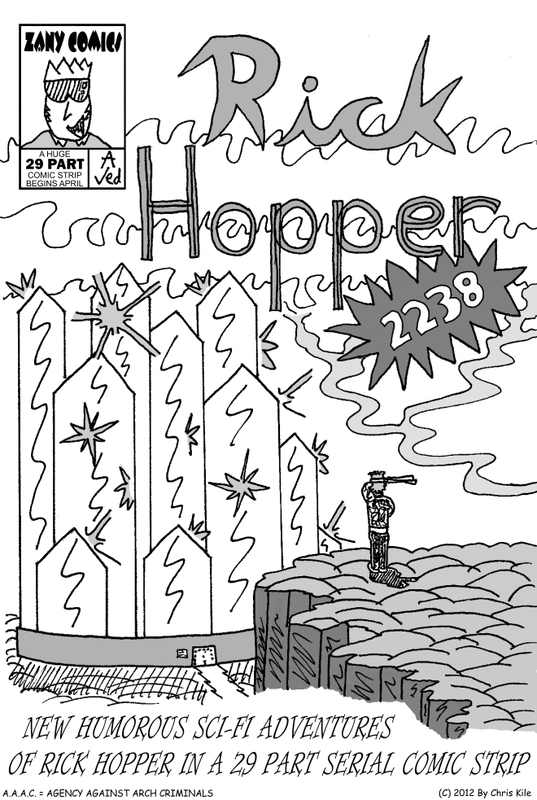 I drew a larger more detailed version of it for the Rick Hopper comic strip cover. You can see it HERE.